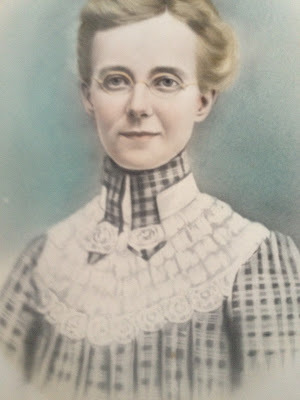 Beautiful antique crayon portrait of a Woman with glasses and a calico high-necked dress. Large framed ‘crayon portraits’ were made in the 1800s and early 1900s. These were artistic photographs that resemble a cross between photographs and charcoal or crayon sketches. They can be monochrome or have charcoal coloring. This portrait is beautifully coloured. The photographer began the process with a light photograph and then embellished it with chalk and crayons. Mostly you will find albumen crayon portraits from the late 1800s. A great way to have an instant ancestor or just a nice piece of art to hang on your wall.